And we did it!! After 23 years (since the 1992 Rio Summit) of endless discussions in one of the most complex negotiation process in history, Humanity finally came together as one, and set a sustainable path to preserve and protect the one common Home we’ve got. “Our collective effort is worth more than the sum of our individual effort. Our responsibility to history is immense.” -Laurent Fabius, President of the COP 21 UN Climate change conference and French Foreign Minister. “History will remember this day. The Paris Agreement on climate change is as a monumental success for the planet and its people.” -U.N. Secretary General Ban Ki-moon. “You’ve done it, reached an ambitious agreement, a binding agreement, a universal agreement. Never will I be able to express more gratitude to a conference. You can be proud to stand before your children and grandchildren.” -French President Francois Hollande. 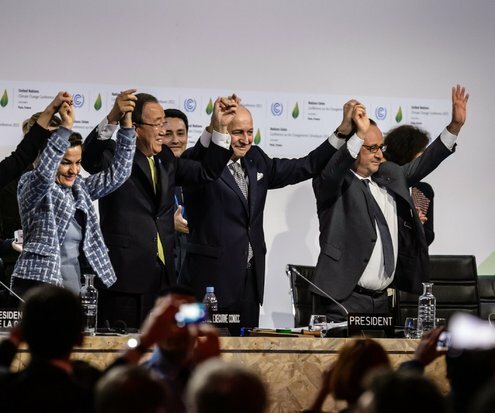 “I believe this moment can be a turning point for our planet. We’ve shown that the world can come together to meet the challenge of climate change, and that we can leave our kids and grandkids a planet that’s safer, more secure, more prosperous, and more free. And that is our most important mission in our short time here on this Earth.” —US President Barack Obama. 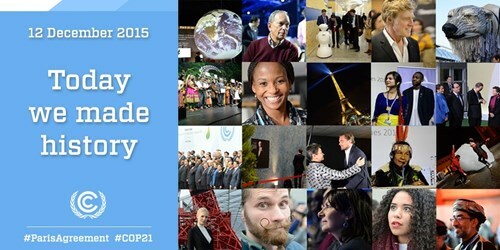 “Successive generations will, I am sure, mark the 12 December 2015 as a date when cooperation, vision, responsibility, a shared humanity and a care for our world took centre stage.” -Christiana Figueres, Executive Secretary of the UN Framework Convention on Climate Change. “Years from now, our grandchildren will reflect on humanity’s moral courage to solve the climate crisis and they will look to December 12, 2015, as the day when the community of nations finally made the decision to act.” -Al Gore. “The world has come together behind an agreement that will empower us to chart a new path for our planet: a smart and responsible path, a sustainable path.” -US Secretary of State John F. Kerry. The Agreement itself is not perfect however, as Obama honestly put it, being even insufficient per se to achieve the cited goals. But, on the one hand, it is structured in a flexible way, allowing parties to adopt more ambitious cuts in emissions as new solutions become available. By fixing an ambitious long-term objective via a legal instrument within an international framework the ideal conditions are set for transformational change to occur. While in the past, the reduction of greenhouse gases and the pursuit of sustainability concerned only a few pioneers and visionaries, it has now become the business of all. 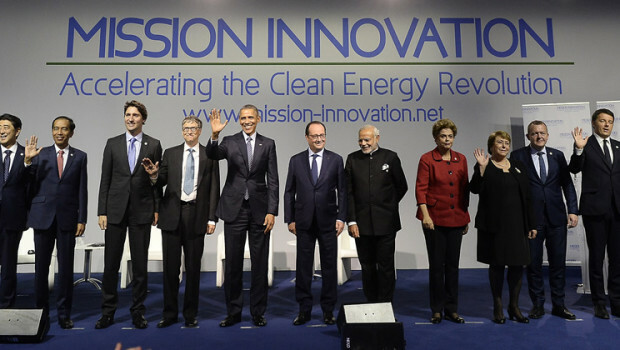 A clear, unambiguous and powerful signal has been sent to governments, investors, financial institutions, entrepreneurs and innovators, that the transition to a clean energy-powered and carbon-neutral economy is now a top priority for all countries and socio-economic agents alike. Paraphrasing Ban Ki-moon, “markets now have the clear signal to unleash the full force of human ingenuity.” It is now up to all of us to put hearts and brains into the matter and make this promise a reality our children can be proud of. The capacity of the human species to reinvent itself is unparalleled. 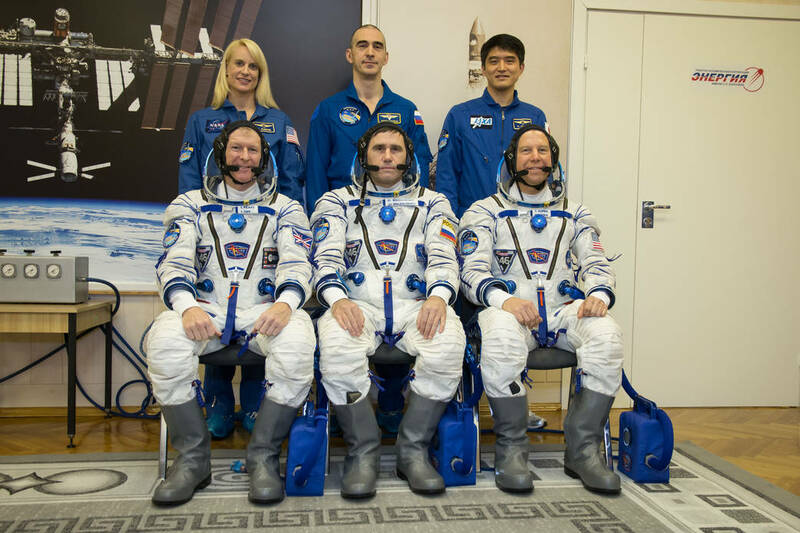 Let’s take for instance Space Exploration. In less than a decade, back in the 60s, we were able to set foot on the Moon. Today, in the last 10 years or so, we have discovered hundreds of extraterrestrial planets, some potentially habitable, and might as well be on the cusp of discovering alien life out there. The International Space Station stands out (at least until last Saturday) as the single most politically complex, technologically challenging, yet incredibly successful joint program the international community has ever undertaken together, with space agencies from the United States, Russia, Europe, Japan, and Canada working shoulder to shoulder, literally, to advance science for the common good. A proven example of how unimaginable human progress (not even the sky is the limit!) can be achieved when wills are aligned and forces joined. If we want to, we may very well be about to witness, and be part of, the fastest, boldest and most consequential transformation humankind has ever experienced. “It always seems impossible until it’s done,” said Laurent Fabius quoting Mandela to describe the relevance of the accomplishment made in Paris. Innovation being one side of the equation, the other, naturally, drive. The drive of millions of people demanding real action from their governments, while leading by example themselves embodying more sustainable lifestyles. The role civil society has played all throughout the process, and ever since the inception of the whole environmental movement in the 60/70s, has been crucial to say the least. The Climate Movement itself took shape in Copenhagen in 2009, when NGOs from across the board came together under the common climate flag. “To change everything we need everyone,” was its motto. And so it grew and grew, as citizens from all walks of life, including minorities and vulnerable communities, supporting a variety of social and environmental causes, joined in, connecting the dots between their own aspirations of justice, equality and peace, and Climate Change. 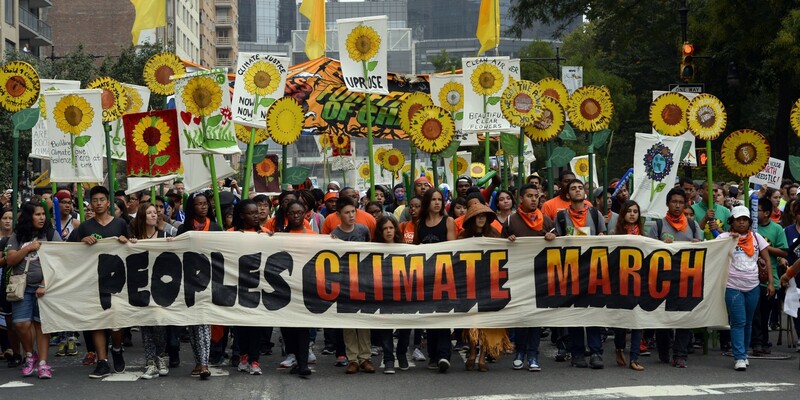 “Climate Justice,” claimed them all in unison, well into the halls of the COP21 site in Paris. And their voice was heard, I can tell you that. One angle was slightly missing nonetheless, that of sustainable small and medium enterprises and entrepreneurs. Businesses are usually well represented in these arenas, and such was the case in Paris (see the RE100 initiative for example), but it is fundamentally large companies taking the stage on behalf of all, most times. A seed of change was previewed at COP21 though, in a EU official side-event, GreenEcoNet, a European Comission-funded joint initiative by the Stockholm Environment Institute, the Green Economy Coalition, JIN Climate and Sustainability, Centre for European Policy Studies, the Ecologic Institute and the University of Piraeus Research Centre, called on all green SMEs and ecopreneurs across Europe to participate and share their solutions to the climate challenge, as well as their needs to scale up impact. 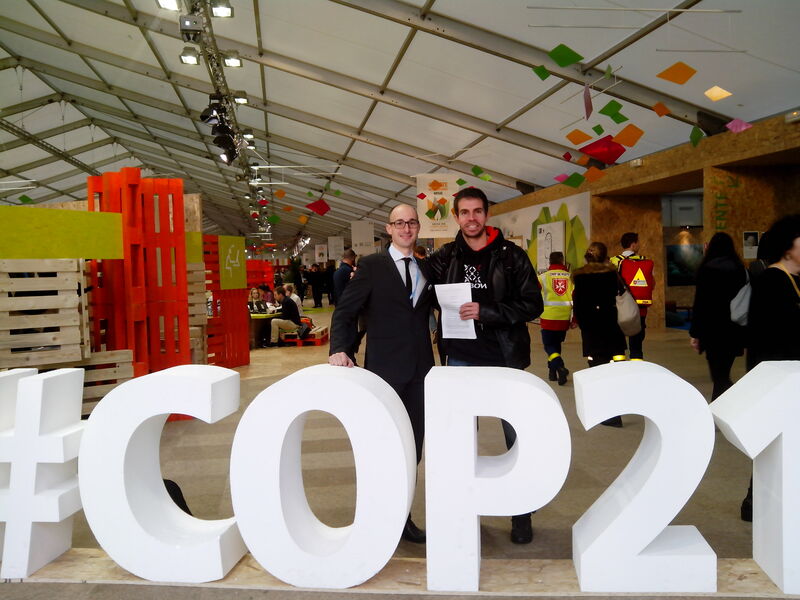 On December 9th 2015 at 18:15 CET, in the Luxembourg room inside the EU Pavilion in the blue zone of the COP21 site (I will never forget those coordinates! ), the GreenEcoNet consortium magnificently hosted its 5th Thematic Workshop “Opportunities and challenges for SMEs in realising the COP21 vision”. Ecopreneur.eu -Europe’s Sustainable Economy Alliance, Greenbiz its partner in Spain, and Entreprendre Vert its French counterpart, we eagerly responded to the call and actively contributed, bringing the voice of the more than 1,500 sustainable SMEs and professionals that belong to our network. Speakers included Corrado TOPI, from the Stockholm Environment Institute – University of York Centre; Chris HOPKINS, from the Green Economy Coalition – International Institute of Environment and Development; Terri KAFYEKE, from the Ecologic Institute; Vasileios RIZOS, from the Centre for European Policy Studies; Jesus IGLESIAS from Greenbiz; Frédéric BENHAIM from Entreprendre Vert; and Gregorio M. TORAL, as the guest green startup founder (winner of the “Climate Champion Awards 2015”) from Ciclogreen. Helen MOUNTFORD, from the World Resources Institute and the New Climate Economy, moderated the enriching conversation with ease and class. GreenEcoNet banner and speaker tags. All ready to start. 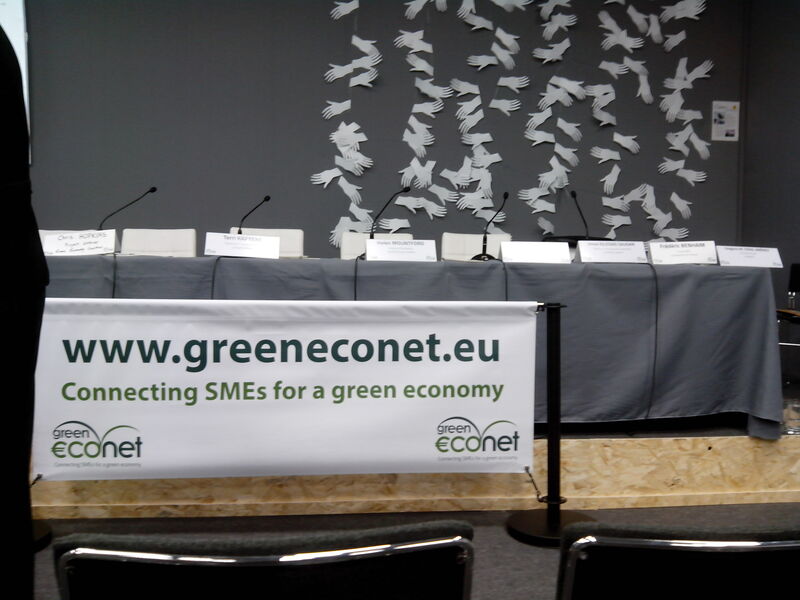 COP21 official workshop on “Opportunities and challenges for SMEs in realising the COP21 vision”, organized by GreenEcoNet on December 9, 2015 at the EU Pavilion. As we anticipated in our pre-event post, ecopreneurs have a lot say when it comes to mitigating CO2 emissions and adapting to climate change impacts. By creating quality green jobs, implementing circular economy solutions locally, and favoring neighboring initiatives, they empower local communities and individuals to embrace more sustainable lifestyles, ultimately setting proper conditions for democracy, cohesion and peace to flourish and thrive. To get there however, they require a certain push, given especially the little resources they posses, around areas (enablers) such as promotion, networking, appropriate legislation at all levels, access to funding, markets of eco-minded consumers, internationalization opportunities, etc., as both GreenEcoNet and Ecopreneur pointed out, as a result of their research and consultation procedures. For the sake of illustration, Ecopreneur we presented some preliminary yet telling results from “Ecopreneurs for the Climate 2015” -#ECO4CLIM15-, the Global Week of Green Business and the Climate Movement that took place on November 23-28, along 7 european cities from 4 EU countries, bringing together more than 500 people, 50+ organizations and 30+ companies from all sectors and sizes, to identify and co-create, from a multi-stakeholder perspective, business solutions to the mitigation and adaptation challenges posed by Climate Change. Preparations for the 2016 Edition, scheduled for October 03-09 2016, are already underdway. You can now become a partner or add your city/community to the growing “Ecopreneurs for the Climate” movement. “Ecopreneurs for the Climate 2016“, the Global Week of Green Business and the Climate Movement 2016 Edition, to take place on October 03-09 2016, all across Europe. Talking about international cooperation, in the COP21 conference rooms a new, groundbreaking multilateral partnership in the making emerged. During the workshop, as well as in subsequent exchanges, a magical atmosphere prone to synergies reigned, crystallizing in a range of ideas to be explored in the coming weeks, where GreenEcoNet and Ecopreneur can work closely together to empower ecopreneurs all over Europe and the world at large. Our fields of activity complement each other to perfection: while GreenEcoNet primarily focus on research, Ecopreneur does on business innovation, with both converging in policy recommendations. 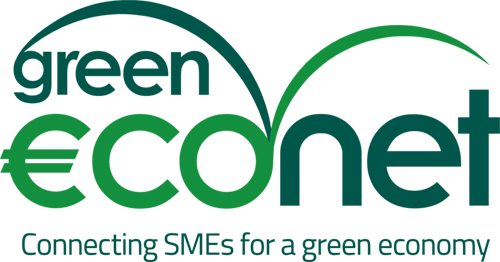 Besides, Ecopreneur’s member green businesses are ideal targets for GreenEcoNet’s SME-oriented platform seeking to both promote their projects and exchange best practices. All considered, via joint research & innovation activities, we can easily magnify our reach and impact, for the ultimate benefit of our cherished ecopreneurs and the sustainable economy as a whole. 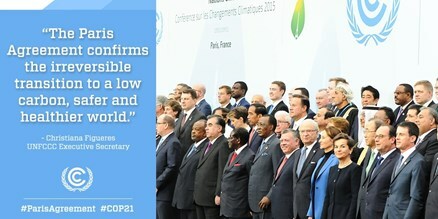 Add to that the fact that the global framework put forth by the Paris Agreement is now going to spearhead and fund sustainable innovation and exchange of know-how among countries, and our shared endeavor at GreenEcoNet-Ecopreneur unfolds naturally in front of us: transfer the outcome of our work to other countries and regions of the globe to help them engage in similar practices. Last but not least, as the COP21 proved, there is a noticeable absence of this particular stakeholder -green SMEs and entrepreneurs- in international forums and meetings, which prompts us to commit to consulting them and carrying their torch up high.